In listening to Jackson’s recording, however, it is also evident that the Gospel style she used didn’t develop in a vacuum. Thomas Dorsey, who some (like Richard Crawford in his book American Musical Life) identify as one of the founding forces in Gospel Music worked and toured with Mahalia Jackson to develop the Gospel Sound. What is impossible to ignore in these recordings is the similarity it has to earlier Blues traditions. 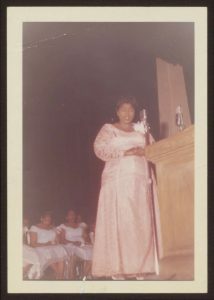 Mahalia Jackson drew inspiration for her vocal technique from the likes of Ma Rainey and Bessie Smith. However, instead of traditional Blues topics for her songs, she sang sacred music. Mahalia Jackson demonstrates the increasing readiness of popular music in the 20th century to change and rely on the music that came before it while influencing the music that would come later. While Gospel certainly was and is a distinct tradition from Blues or Rock and Roll, the interaction between these genres cannot be denied. While the article from the Chicago Defender and the photograph of Jackson now housed in the Rock and Roll Hall of Fame demonstrate the complicated history of musical development and transmission, they fail to acknowledge another fundamental part of music: politics. Musicologists and musicians alike, myself included, sometimes like to think of music as apolitical. I find it all too easy to hide behind theoretical analysis and stark historical facts when considering the development of musical genres. To do so, however, is to help erase and negate narratives of privilege and oppression that infected all aspects of history, including our beloved music. Mahalia Jackson’s recordings and life as a whole serve as an example of how music works as part of an inescapable political system. Her music was an influential part of the Civil Rights movement. She worked with Martin Luther King Jr. throughout the Civil Rights campaign and even sang at the 1963 March on Washington. By the very value of her identity (being a black woman in the 1960s), she and her music had no choice but to be deeply embedded in the social struggles of the 1960s. Click the play icon below to listen to this interview where Jackson speaks about her struggle to maintain Dr. King’s policy of nonviolence when confronted with egregious acts of racism throughout her career and in her personal life. As interesting as Mahalia Jackson’s involvement with the developing hybridity of popular music in the 1960s is, equally important are her efforts to mobilize music as a political tool. Crawford, Richard. America’s Musical Life: A History. New York: W.W. Norton, 2005. Henry Pleasants, et al. “Jackson, Mahalia.” Grove Music Online. Oxford Music Online. Oxford University Press, accessed October 17, 2017, http://www.oxfordmusiconline.com/subscriber/article/grove/music/A2249902. Rock and Roll Hall of Fame. “Mahalia Jackson.” Rock & Roll Hall of Fame. Accessed October 17, 2017. https://www.rockhall.com/inductees/mahalia-jackson. Today, I will remain in the vein of composers and their culinary expeditions, as established by fellow author Phil Biedenbender (Here’s his post on Mahalia Jackson and her fried chicken excursion). 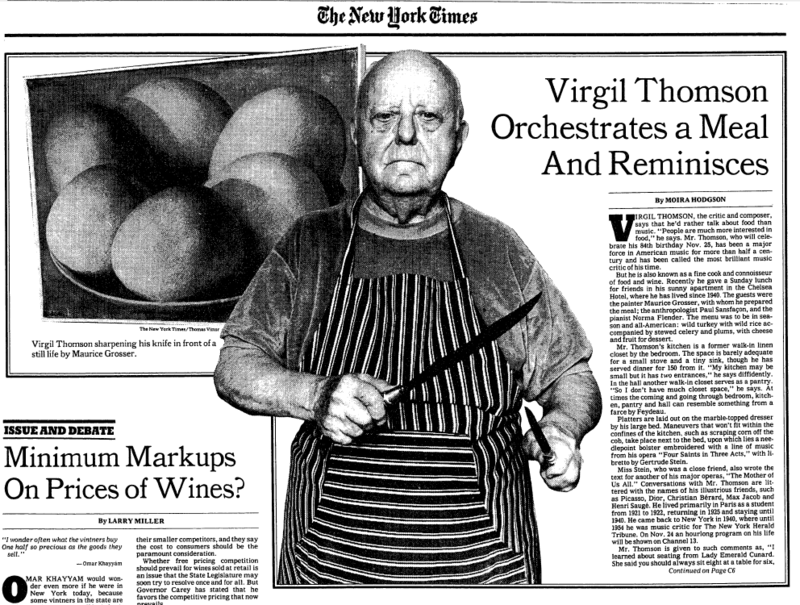 A pioneer of the “American” sound in classical music and winner of the 1949 Pulitzer Prize in music, Virgil Thomson had some serious musical chops. But did you know he also cooked gourmet lamb chops? We know Virgil Thomson mainly through his acerbic wit revealed in his writings and musical critiques. Thomson wrote many letters to his friends and acquaintances, some criticizing music, some about special occasions, and even some advice about various topics. His prose is known for being blunt and often funny even if he was being offensive. Thomson’s curiosity was insatiable, composing for almost every genre of music and absorbing all that was new around him. Thomson also had a passion for fine wine and dining that could only be matched by his passion for music. He once stated, “If I was going to starve, I might as well starve where the food is good.” Thomson’s dinner parties were legendary. Few people were invited since space was limited in his residence at the Hotel Chelsea in New York City, home to other greats such as Bob Dylan and Leonard Cohen. But those that were fortunate enough to attend were treated to an amazing meal and enlightening conversation. He may have been one of the most well-connected men in New York during his time, as people worldwide wanted to stay in contact with him. As enigmatic and detached he may seem in writing and his compositions, Thomson’s love of food makes him at once more personable as well as knowledgable. People would have not gone to his parties if he was a discourteous host or did not have engaging discussions. He showed a human side of himself that people may have never thought existed through the various meals that he hosted. Even as he was getting into his 80s and 90s, Thomson never lost his vigor and remained as sarcastic as ever until his death. I wish I could have had the pleasure of being served his pot roasted guinea pig. 1. Hodgson, Moira. 1980. 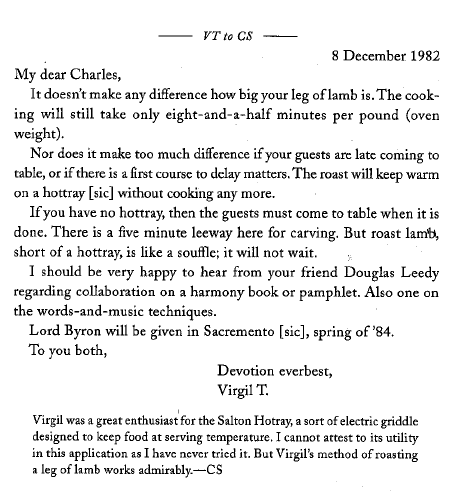 “Virgil Thomson Orchestrates a Meal And Reminisces.” New York Times (1923-Current file), Oct 29. http://search.proquest.com/docview/121418217?accountid=351 (Accessed March 22). 2. Shere, Charles, and Margery Tade. 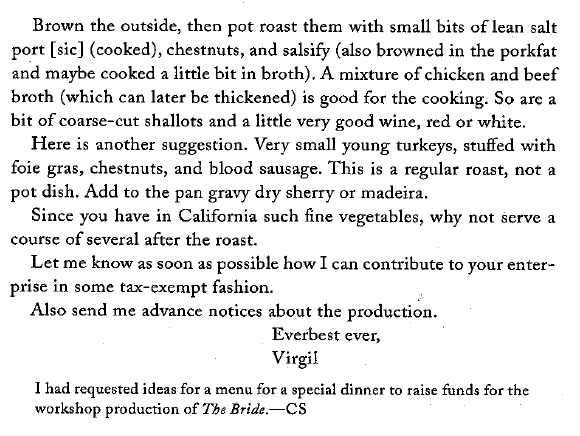 Everbest Ever: Correspondence with Bay Area Friends (Berkeley, CA: Fallen Leaf Press, 1996), 30. In Ava DuVernay’s 2014 film “Selma”, poetic license is taken in depicting the role gospel singer Mahalia Jackson played in the 1965 Selma to Montgomery voting rights marches. During a moment of doubt, Martin Luther King Jr. (played by David Oyelowo) phones Jackson (portrayed by R&B singer Ledisi) and asks her to share “the Lord’s voice” with him. She answers by singing the immortal gospel classic, “Take My Hand, Precious Lord”. This song was a standard at prayer meetings and Civil Rights marches, and was even performed by Jackson at King’s funeral. It was her showstopper, and the song that was requested the most from her by both King and her audiences worldwide. At the 57th Annual Grammy Awards on February 8th, 2015, the song was performed as a prelude to a “Selma tribute”, which featured R&B artist John Legend and rapper Common performing their Academy Award Winning Song from the film titled “Glory”. However, the song was performed not by Ledisi but by the undisputed modern queen of R&B: the one and only Beyoncé. This inspiring and powerful performance elicited wide acclaim, though some were quick to point out that a true tribute would have featured Ledisi (who was in attendance), rather than Queen Bey. Criticism escalated when it became apparent that Beyoncé herself had approached Legend and Common about performing the song, as it wasn’t originally planned to be part of the show. However, amid the accusations of self-promotion and concerns over unfair exclusion, the opportunity for an discussion regarding style was unfortunately missed. Whereas Jackson displays virtuosity in the emotional range of her voice, Beyoncé relies more on virtuosic vocal runs more akin to flashy pop music than to a traditional gospel style. The spiritual component of Jackson’s version is amplified by the seemingly extemporaneous approach to the melody by Jackson and the fluid approach to the harmonic changes by her pianist and organist. Contrastingly, aspects of Beyoncé’s version seem meticulously rehearsed, from the timing her background singers movements to her rather parodic head movements at about 2:10. That isn’t to say that any of this is bad, or that Ledisi would have performed any better or differently than Beyoncé. No one can or should deny how impressive and moving this performance is. Ledisi herself defended Beyoncé better than anyone. He may as well have been speaking of the song too. Duckett, Alfred. “Mahalia Jackson Like Applause (Beg Pardon) Amens at Concerts.” The Chicago Defender (National Edition) (1921-1967), Jun 01, 1957. http://search.proquest.com/docview/492918933?accountid=351. Mays, Benjamin E. “Reminiscing about Mahalia Jackson.” Chicago Daily Defender (Big Weekend Edition) (1966-1973), Feb 26, 1972. http://search.proquest.com/docview/493504320?accountid=351.